An Australian TV advert portraying New Zealand rugby players carrying women's handbags has upset the All Blacks. An advertisement shows the All Blacks players performing the haka challenge carrying computer-generated handbags. It refers to an incident when former captain Tana Umaga broke up a fight by hitting fellow All Black Chris Masoe over the head with a woman's handbag. "It's insensitive, I think, to Maori and disrespectful of the All Blacks," said assistant coach Wayne Smith. Mr Masoe, who was allegedly reduced to tears by the blow, was later fined NZ$3,000 (£1,000) by the New Zealand Rugby Union. The incident generated considerable media coverage and sparked jokes at the All Blacks' expense. 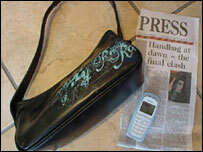 The handbag went on to fetch NZ$22,750 ($13,650, £7,500) in an online auction. The television advert is promoting Saturday's Tri-Nations Test between New Zealand and Australia in Christchurch. Australian coach John Connolly told local radio he had not seen the advertisement yet.